"Monografie Matematyczne" series, vol. 7, Polish Mathematical Society, Warszawa-Lwów, 1937, p. VII+347. 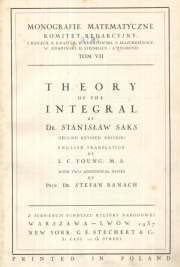 The integral in an abstract space. Functions of bounded variation and the Lebesgue-Stieltjes integral. Derivation of additive functions of a set and of an interval. Area of a surface z=F(x,y). Functions of generalized bounded variation. Derivates of functions of one or two real variables. We deeply thank Prof. dr. hab. med. Alina Filipowicz-Banach and the whole of family of Stefan Banach for their permission to post copies of all the works of Stefan Banach on this website. We thank Prof. dr. hab. 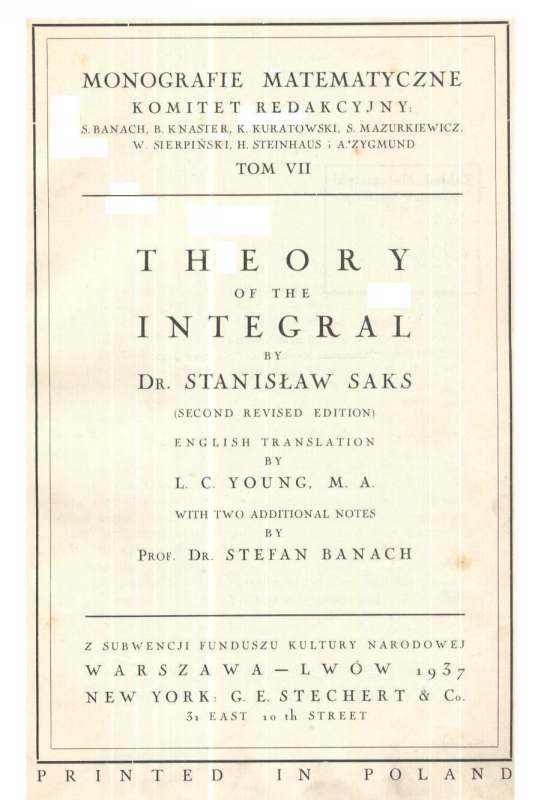 Stefan Jackowski, the Head of the Polish Mathematical Society, for the permission to post copies of books coauthored by Stefan Banach and published by the Polish Mathematical Society in the series of "Monografie Matematyczne" on this website.